Visitors to the Knife River Indian Villages National Historic Site in North Dakota can learn more about the lives of the Upper Missouri River's Northern Plains Indians. Earthlodge people were farmers who lived alongside the Upper Missouri River, as well tributaries, in essence, but also hunted bison and other animals. The historical land was a significant trade center for Native Americans for several hundred years. After 1750, it became an important trading market for those trading fur. Congress established Knife River Indian Villages as a national historic site in 1974 to preserve an area rich with culture and history. There are a wide variety of things to do and see at Knife River Indian Villages. It all really depends on how long of time guests have during their visit. If visitors only have an hour or two, they can start their visit with the short video Maxidiwiac, a film about the Buffalo Bird Woman's life. The museum features exhibits highlighting the culture and history of the Hidatsa people, including artifacts from village sites and decorative arts made by the Northern Plains Indians. 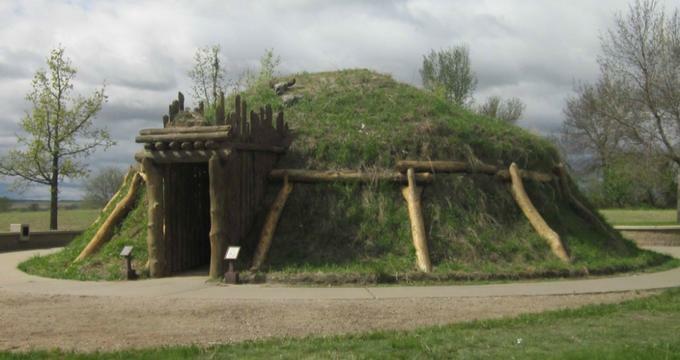 Visitors can then venture outdoors to explore the reconstructed full-scale Earthlodge, drying racks, and Hidatsa garden. Guests can take a stroll along the 1.3-mile Village Trail to see the remnants of the Awatixa Village and Awatixa Xi'e Village. At the Awatixa Village, a trail loop exists that consists of a walk beside the Knife River. A visit during half of a day allows for even more hiking along the trails of the Knife River Indian Villages National Historic Site. The 2.2-mile North Forest Trail takes visitors through native prairie and bottomland forest. Hikers can then continue down the 2.8-mile Missouri overlook trail for amazing river views. After arriving in the forest area, visitors can choose to walk the short Big Hidatsa Trail to see the Hidatsa Village. Guests interested in bird watching should be sure to bring their binoculars and pick up a birding checklist from the site's visitor center. For those who have an entire day to visit the Knife River Indian Villages, the 6.2-mile Two Rivers Trail follows along the Knife River towards the national historic site's south end. At the trail's end, hikers can view the sight of the Knife River meeting the Missouri River. Visitors can try their luck at fishing for trout, catfish, walleye, and northern pike along both rivers. The Knife River Indian Villages site follows the fishing regulations and rules of the state of North Dakota. The Knife River winds its way through North Dakota's Mercer County, flowing into the Missouri River around Stanton. A forested peninsula is created throughout part of the site by park land bordering both sides of the two rivers. The remaining land of the 1759 acres is located within a few hundred yards of the rivers. The site was established in 1974 for the preservation of certain archeological and historical remnants of the agricultural lifestyles and culture of the Northern Plains Indians. The land consists of exotic grasslands, native short grass prairie, culture village sites, some wetland areas and sandbars, and 450 acres of hardwood forest.